Freeform Coaster Builder: For the first time, players can experience a roller coaster builder optimized for console allowing them to build any roller coaster they can imagine in minutes. Single Player and Multiplayer: Play through the progression system and sandbox modes or challenge friends to build and ride in multiplayer mode. Stunning Environments: Explore and ride through the wild and hot desert of the Canyon for a daytime thrill-ride or the captivating skyline and the streets of the City as you embark on your adventure at dusk. Ride and Shoot: Shoot down the highest number of targets as you ride to reach the top of the leaderboards. Realistic Physics: Experience a thrilling coaster adventure with realistic physics built into the game to make you feel adrenaline-pumping excitement. Pre-Built Coasters: Jump straight into the immersive experience with pre-built coasters. Social Features: Share your incredible roller coaster creations via PSN. 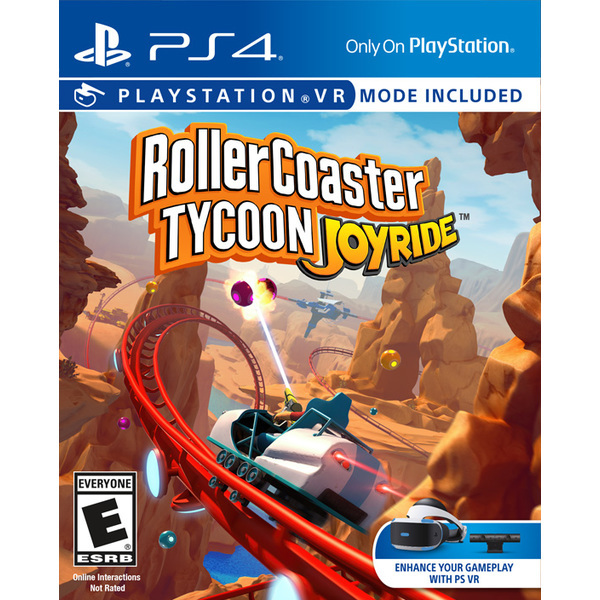 Soar through the sky with RollerCoaster Tycoon Joyride™, a fully immersive, roller coaster builder and rider exclusively for PlayStation® 4 and enhanced for PlayStation® VR. 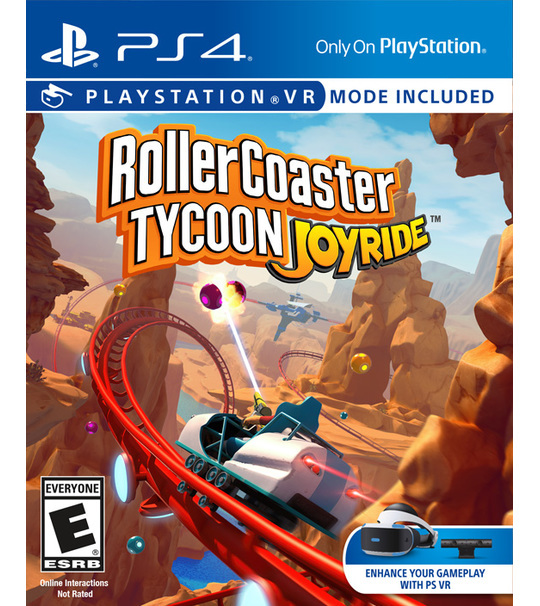 In the first virtual reality game in the RollerCoaster Tycoon® series, players are challenged to build and ride breathtaking roller coasters in thrilling environments with an easy-to-use coaster builder. In a twist on the coaster experience, riders can shoot, blast, and explode moving targets to reach the top of the leaderboards. Compete against friends and challenge them in multiplayer mode and share your incredible coaster creations with other players on PlayStation Network. With special bonus events, slo-motion time and more fun-filled features, RollerCoaster Tycoon Joyride delivers a pulse-pounding and exhilarating experience.